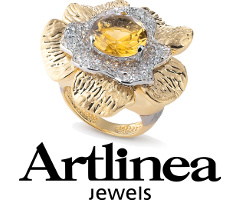 Passion for gold, diamonds and other precious stones, but also precision, style and happiness - these concepts form the basis of our Artlinea collections, where design and tradition meet the brilliance of gold and colours of precious stones in great designs and fluid lines that reinterpret floral and abstract forms. Pendants, colliers, earrings, bracelets and rings of many different collections all underline the value of femininity. All Artlinea collections are based on the study of current fashion trends, their reinterpretation with original forms, as well as precise workmanship, and 100% made in Italy. Artlinea was founded in 1983 with the mission to combine exceptional cultural assets in the form of Aretine craftsmanship with modern construction and production technology. Artlinea is one of the biggest producers of jewellery in Italy and everything is done in-house: from the original idea to the realisation of a piece of jewellery, Artlinea products are designed, projected and manufactured in the same place. All Artlinea Gold Jewels are characterised by their excellent design and fine materials and our necklaces, bracelets, earrings, rings and pendants are all extremely wearable.